It's somewhat fitting to end our year with some new photos of one of next year's most anticipated (at least for me) attractions. 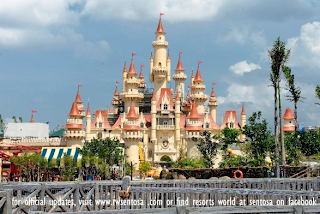 Universal Studios Singapore has uploaded a bunch of new shots, covering the entire park. It's really starting to look finished! Check them out here. And Happy New Year! 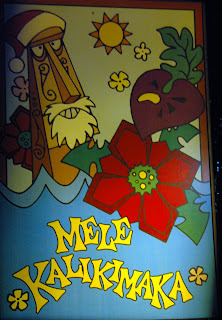 Best wishes for a happy and safe 2010! Is your school or office a ghost town this week? What a coincidence--So is this park! Something tells me that a visit to Ghost Town in the Sky would be infinitely more exciting, though. Let's journey back in time to see what this park had to offer prior to its closure in 2002 (and, of course, eventual reopening in 2007). Guns don't kill people. This guy does. But don't worry, it's all [gun] smoke and mirrors! Throughout its history, Ghost Town in the Sky has been famous for its authentic recreation of an old western town and the accompanying "good guys versus bad guys" shootouts that ensue. According to this brochure, Ghost Town's gunfighers are internationally known. Lots of parks are themed after ghost towns, or at the very least have a wild west-themed area. What distinguishes this park? Location, location, location. Ghost Town in the Sky is perched 3300 feet above sea level in Smoky Mountain country. As they say, getting there is half the fun! And selecting a means of transportation is the other half. 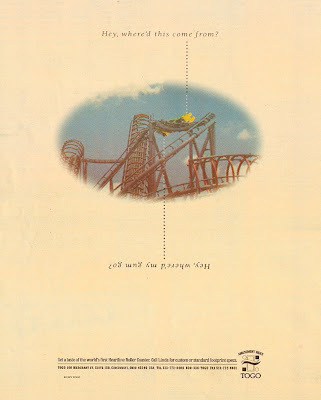 At the time this brochure was published, you had your choice of chairlift, incline railway, or shuttle bus. 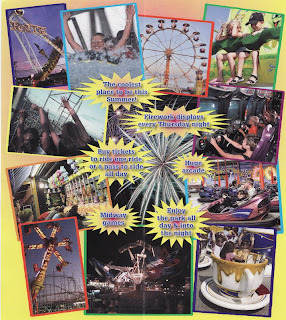 While I can't pinpoint an exact year for this brochure, some of the fine attractions pictured here--such as the Sea Dragon and Casino (Trabant)--did not reopen with the park in 2007, so at least we have that frame of reference. But the Indian dancers and Can-Can girls are back, as is the Red Devil roller coaster, which now sports new trains and a new paint job and goes by the name Cliff Hanger. Ghost Town in the Sky is hardly located in the "wild west", but surely its proximity to cities such as Gatlinburg and Pigeon Forge contribute to its honky tonk flair. It may be a little more than a hop, skip, and a jump away for most people, but wouldn't you be willing to log the extra mileage to visit the Mile High Fun Center? (Their wording, not mine. Seriously. Check the second panel!) Here's hoping that the park can overcome its continuing financial difficulties and return to the glory days depicted in this brochure. Our gun-toting friend from the front cover is keeping his spurs crossed! 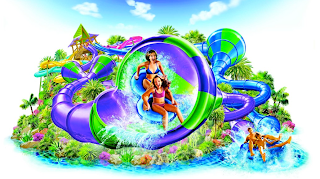 The three Hawaiian Falls water parks located in Texas will all be adding a new thrill ride named the Torpedo in 2010. 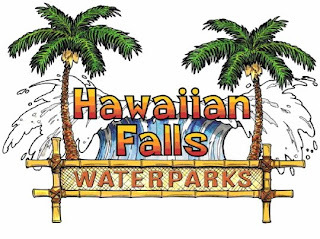 I have to admit, I'd never really heard of Hawaiian Falls, but it's a small chain of three water parks located in the Dallas-Fort Worth metroplex, all of which appear to have opened within the last decade. The parks were actually managed by Herschend Family Entertainment for a year before parting ways. The Torpedo slides being added to the parks actually appear to use the same starting mechanism as on the AquaLoop slides, only these don't have the loop part. Described as twin 4 story speed slides, they will be the first of their type and combined represent a total investment of $2.6 million. All three will be provided by Whitewater West. Pretty slow news week, eh? Most parks close their offices from late December until after the new year so you can almost hear the crickets chirping in our little industry here. 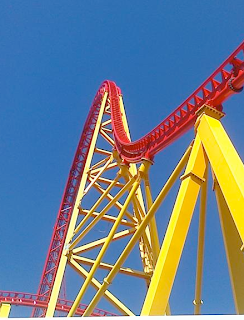 I did want to drop a note that KDFansite has some new photos of Intimidator 305 at Kings Dominion up. The park has finished the ride's 2nd hill, and with the rest of the track being so low to the ground they are really flying along. Head over to their site to see the photos. I thought that a beach side park was perfect for this week's Aerial Antics, mostly because I'm wishing it were summer pretty bad right now. There's always that post-Holidays letdown that's a mixture of relief that it's over but a dreading of the long cold months that are ahead. The quaint kiddie land features a wooden ride from the park's opening. "Opened in 1928, this is the first totally planned amusement park in America, and was designed specifically to accommodate automobile travelers. After more than 50 years, its Art Deco design and architecture remain essentially unaltered, and it has served as a prototype for contemporary theme parks. Several of the park's original rides, including the Dragon Roller Coaster, still operate and are of major individual significance because of their rarity." Oh no, not one of those Zamperla Volares! The fact that the park was fully planned by designers really shows in the long, beautifully landscaped walkways that cross the park. A water ride surrounded by water. At low tide, though. The park hasn't let it's long history make it into a museum piece, though, as they've been adding new rides and attractions to create a nice mix of modern and classic offerings. You can find the latest and greatest, but also enjoy a slow walk along the tree lined midways just taking in the atmosphere. The above shot contains many notable items, such as the park's famous art deco tower, the Log Flume which soaks riders all summer long, and an S&S Double Shot tower. 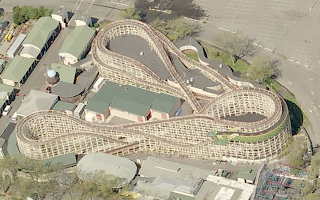 Playland's largest coaster is the Dragon, a famous Fred Church designed wooden ride. It has a long tunnel with the opening dressed up as a dragon's head that swallows the train... hence it's name. Just wanted to end with a nice shot of the property with the sun reflecting off the water. 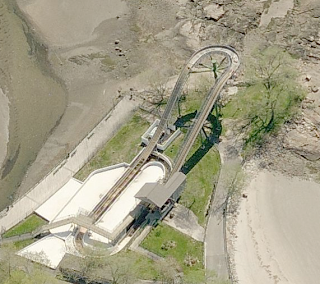 If you want to zoom around Bing's aerials for the ride, click here. We have had this DVD for awhile and finally both had the chance to sit down and watch Fountaine Ferry Park - The Lost Footage, since we were thoroughly entertained by Jerry's first effort, Fountaine Ferry Park: A Time of Innocence and we were blown away by the exhibit at the Frasier Museum, the bar was set pretty high for our expectations but it delivers. The footage on the DVD is from the 1940s, 50s and 60s, its shot with a 16mm movie camera, with no sound, mostly by Cinematographer Foster Mattingly, who makes a cameo at the beginning of the 1960 segment. The scenes are a mixture of color and black and white, which is grainy and blurry at times. But none of that really matters, for the footage is amazing. The segment from the 1940s shows people dressed in their Sunday best, enjoying wire walkers, dog acts and a variety of flat rides. We loved the sub-titles pointing out the boss going to work and an assistant manager "testing" one of the rides. In the 1950s the general admission was 12 cents, guests enjoyed professional wrestling including a midget match, and acrobats. There's some amazing footage showing the acrobats on the airplane ride. Kitchen chiefs, Mame and John Samples, the Comet's front brakeman, Noah Liken and caller/rear brakeman Frank "Pappy" Aubrey are given sub-titles in this segment. The highlight for us was the footage of the new Comet roller coaster. Footage from the 1960s focused on rides for the small fries and featured the brand new turnpike, with battery operated cars modeled after the big tail-finned models of the day. Hand cranked cars, pony rides, a miniature train and the kiddie coaster were also very popular. Jungleland must have been new with live entertainment featuring trained monkey. This DVD also has some bonus segments, the first is well worth the price of the DVD, it's a two-parter, with the first a 1970s segment from a local TV show called "On The Road" featuring Pappy Aubrey still running the Comet, with the park now being called River Glen Park (after Fountaine Ferry closed the park name changed and owners twice) and a reporter doing an on-ride. The other bonus segment is a February 2009 interview of Jerry Rice. Jerry recants his memories, growing up visiting Fountaine Ferry. His most vivid memory was riding the Comet. Mr. Rice also comments on how the park took on a different aura at night and how he had a fondness for the Dentzel carousel that operated throughout the park's history. His favorite was the Funhouse, Hilarity Hall. This DVD get's two a thumbs up from both of us and may we suggest buying it be a great use of that money Grandma gave you for Christmas. Both Fountaine Ferry DVDs can be purchased at Schimpff's Confectionary in Jeffersonville IN. or through TYP Distributors, P.O. Box 745, New Albany IN 47151-0745. Mail order price is $16.95, which includes shipping/handling and applicable sales tax. Contact taymed@aol.com for more information. You have to admit, it's a pretty good ad. If only the rides that Togo created were as good as their advertising! The company was known for their Stand Up, Heartline, and Ultra Twister style coasters, though the rough reputation of these attractions always seem to proceed them. Only a handful of Togo rides ever opened in the U.S., and now only a few of those remain. Probably most notable of them is the "Roller Coaster" at New York, New York in Las Vegas. From the ad above it looks like they were hoping for their "mega heartline" coaster to take off, though we all know how that turned out. Rest in melted down pieces, Viper. Who doesn't want to win a trip? Mt. Olympus Water & Theme Park is giving away a free trip to their property to a lucky winner of their latest sweepstakes. Once the park reaches 12,000 Facebook fans they will randomly select one of them to win the trip. Sounds nice! Things already aren't going well in the sale of Cedar Fair to Apollo Management - there have been several law suits filed against the company since the transaction was announced. Seems many folks aren't too sure that the price Apollo is offering is fair. I'll let you draw your own conclusion. 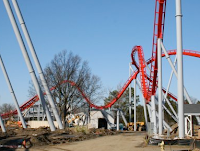 Carowinds reached an important milestone in the construction of their new Intimidator coaster this past week as they placed the final piece of track for the ride. Although it was around 3 months of work, it felt like the coaster went up in just a few weeks! The park placed a couple photos from the event on their Facebook page. In a move that shows that what's good for Cedar Point isn't necessarily good for all theme parks, Knott's Berry Farm has reverted back to it's original pricing structure that goes off of age, not height. The park was juiced up enough about the change to even put out a formal release about it! I suppose the "Brew" no longer has to be Busch in Busch Gardens Tampa and Sea World Orlando's annual Bands, Brew & BBQ special event that begins this February. The event is pretty self explanatory, as it features live entertainment, plenty of cold beer, and some spicy BBQ for guests. For more info, check out the Orlando Sentinel. Epcot has a wonderful holiday tradition going with it's Candlelight Processional, a retelling of the Christmas story with a celebrity narrator and live orchestra and choir. Check out Attractions Magazine's coverage of the event when Whoopi Goldberg was the guest narrator. Finally, although Sabrina really wants no one else but her to enter, Six Flags Discovery Kingdom is hosting a name the baby Giraffe contest in which the winner will receive four tickets to the park among other prizes. If you want to enter (just don't tell Sabrina), click here. This is either the most loved song or the most annoying song in theme park history. This “classic,” written by Richard and Robert Sherman, was first suggested as a round by Walt himself.“He had a great sense of how music could tell a story, “said Richard. 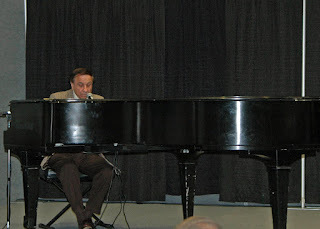 “When Walt Disney demonstrated it to songwriters Robert B. Sherman and Richard M. Sherman, the rides soundtrack featured numerous national anthems all playing at once, which resulted in a musical cacophony. “Walt said, "I need one song" Richard remembers, “it was the strangest thing when Walt called out “cut the music and we could hear all the dolls clacking away without a soundtrack. Their first offering was timed like a ballad, which Walt requested to be sped up so it sounded more cheerful. 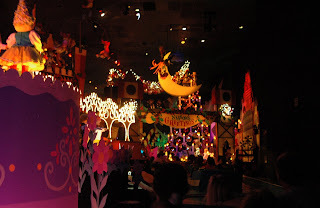 At the first presentation to Walt Disney, Robert and Richard Sherman performed "it's a small world" song while walking through a scale model of the attraction, singing and clapping their hands. 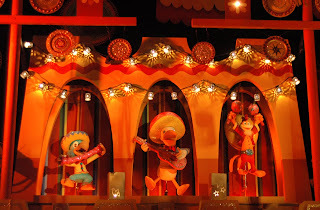 In full spirit of international unity, "it's a small world" song was recorded in various studios around the world. The song was sung by a church choir in London, TV performers in Mexico City, a school chorus in Rome, Italy, and by children from Tokyo, Japan and Burbank, California. The entire attraction was completed in only nine months, still a record for any of Disney’s attractions. The "Children of the World" ride debuted at the 1964 World's Fair Pepsi Pavilion in New York City as a benefit to the United Nations Children's Fund. 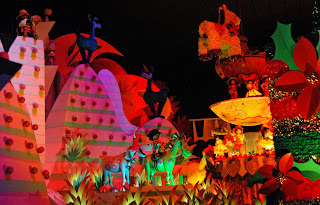 The attraction's whimsical design was done by Mary Blair, who was also an art director on several Disney animated features (including Cinderella and Peter Pan). 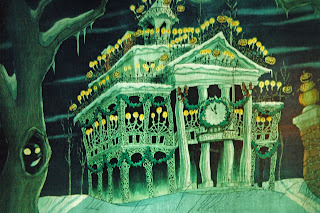 Like many Disneyland and Walt Disney World attractions, scenes and characters were designed by Marc Davis, while his wife, Alice Davis, designed the costumes for the dolls. Many of the dolls were created by Joyce Carlson who is honored with a shop window along the Magic Kingdom's Main Street U.S.A. The sign there reads "Dolls by Miss Joyce, Dollmaker for the World. When it was moved to Disneyland two years later, Walt invited children from around the world to pour water from their homelands into its flume in a gesture of unity during the dedication. Disneyland's version was closed from January to November, 2008, to receive a major refurbishment. The building’s structure was improved, and the attraction's boats and water flume were replaced. 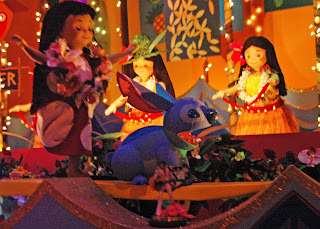 The refurbishment added 29 Disney characters, and the New Guinea Room was transformed into a North America Room, while the New Guinea scene's figures, props, and set pieces were relocated to the South Seas Room. The Attraction also got a new sponsor SYLVANA, which will have the agreement of sponsoring the ride for 12 years. SYLVANA created a new marquee for the ride. 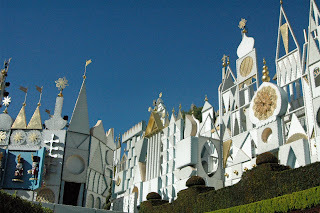 Designers insisted the changes to "Small World" wee even more subtle, and conform to Walt Disney's original philosophy and style while keeping the attraction from becoming "like a museum," said Kim Irvine, director of concept design for Walt Disney Imagineering. "It's what Walt always wanted," she said. "He always said the park would always be changing as long as there was imagination in the world." 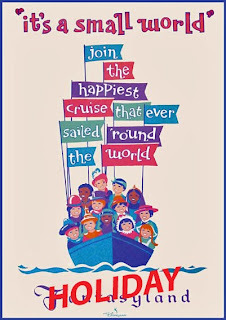 Mary Sklar addressed Disney fans concerns in an open letter, “Our goal was, and always will be, to bring people together, and keep this classic “the happiest cruise that ever sailed around the world” (words I personally wrote for that souvenir guide nearly half a century ago).”The attractions continued success speaks for itself. 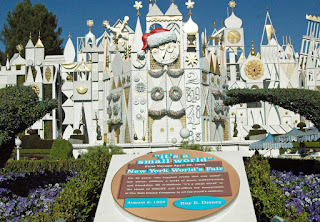 Since 1997, Disneyland has featured "It's a Small World Holiday" during the Christmas and winter seasons. The attraction is closed in late-October to receive temporary holiday decorations inside and outside, and reopens in early-November before the start of the busy holiday tourist season. 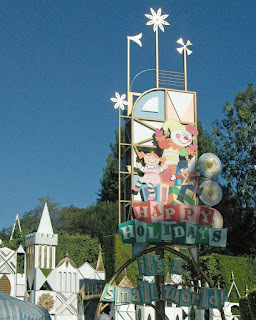 Each year guests look forward to when the transformation of It's a Small World turns into It's a Small World Holiday. 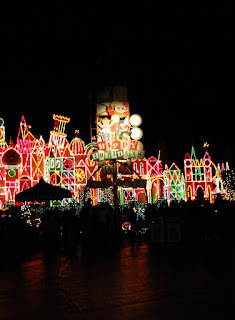 It is a great attraction at Disneyland that really sets the Holiday Season tone for the family. 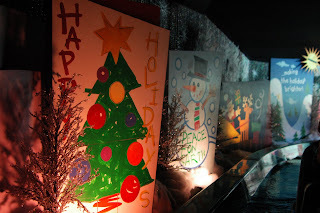 The 20 minute boat ride gives guests the chance to get closer to Holiday traditions across the world while being surrounded by some wonderful holiday music. 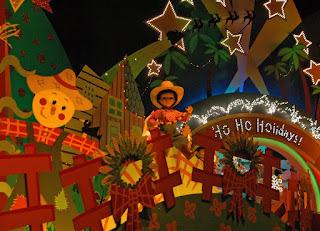 The music alone could possibly being played in your head the entire holiday season even if you only go once on It's a Small World Holiday. The attraction is the same boat voyage through many regions of the world, though the main theme song is not played fully. Instead, the children sing "Jingle Bells" and a bridge of "Deck the Halls" in addition to the main theme. 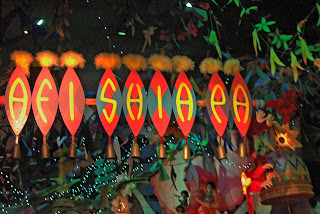 While the ride inside shares the customs and traditions of the people of the world, outside is just as spectacular with music and light shows against the front of the attraction. 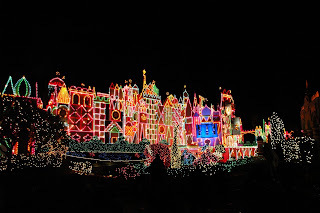 Over 380,000 glittering lights are on the front of the It’s a Small World attraction which is very impressive to say the least. 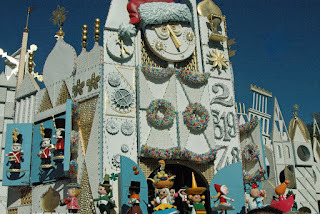 It's a Small World Holiday starts the first week of November at the Disneyland Resort. 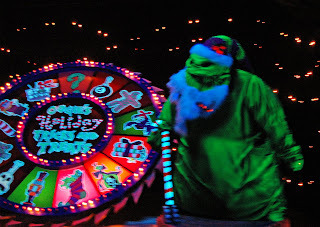 Don't wait too late to see the attraction 'as the closer it gets to Christmas, the longer the lines become. Luckily the queue is outside the building to better appreciate the lights adorning the perimeter. 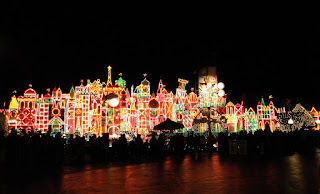 The area usually has many people who just gather around to enjoy the ambiance of all the beautiful lights.So popular it once required a FastPass, the improvements to capacity have eliminated that operational requirement. 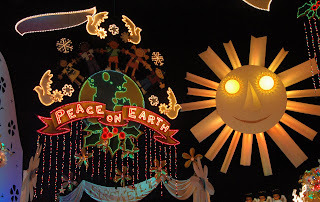 No visit to a Disney park is complete during the season without a stop to It’s a Small World Holiday. 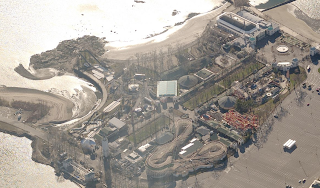 The Best Coaster Poll has released the preliminary winners of the 2009 poll on their webpage. As you probably guessed by the above image, Bizarro at Six Flags New England and The Voyage at Holiday World both topped the lists. Some new rides also made it into the top ten lists. Prowler at Worlds of Fun came in at #7 on the wood poll, and Diamondback at Kings Islands ranked 4th on the steel poll. The full results will be posted at a later date. 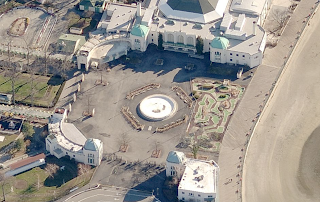 Sabrina's Brochure Spotlight: Palace Playland 200? When I sat down to ponder which brochure to feature this week, I fancied a park in New England. But not just any park--my criteria were strict. It had to be a seaside park, one dating back over a century no less, and featuring--Wait, what's that? HEY!! What do you mean I'm full of it and I just picked the shortest brochure imaginable because I'm too busy wrapping gifts and freaking out to write? I'm going to have to plead the fifth here. Okay, okay: You got me. I did deliberately pick the shortest brochure I could find this week. [Never have been good at bluffing, so why start now? 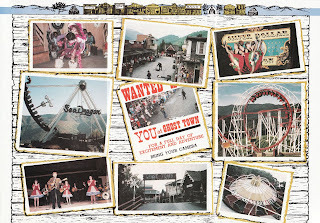 Besides, Santa might be watching...] But that's not to say that Palace Playland isn't deserving of the brochure spotlight! Far from it. 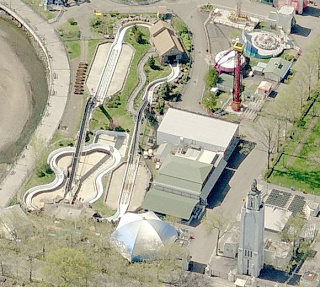 After all, as the cover states, this is New England's only remaining beachfront amusement park. A seaside location is always a plus in my book, but Palace Playland has so much else to offer. From family classics like the Sunwheel and bumper cars to newfangled contraptions like the Zamperla Power Surge pictured in the lower left-hand corner, this quaint little park seems to have a knack for continually upgrading its collection of rides while still maintaining a good old-fashioned park ambiance. 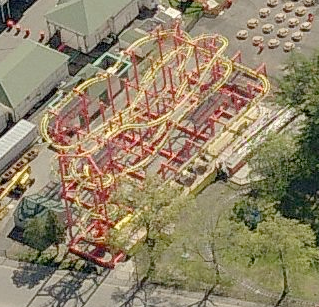 Also pictured here is the Galaxi, one of two coasters at Palace Playland. In addition to the rides and games, note the mention of a "huge" arcade. Since this brochure does not elaborate, allow me to do the honors: We're talking a 24,000-square foot arcade featuring more than 200 games and attractions. That outta keep you busy for a while. 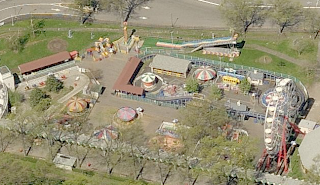 Remember what I was saying about Palace Playland keeping with the times while still maintaining that traditional park feel? (I certainly hope so. I mean...It was only a couple paragraphs ago.) The back panel serves to emphasize my point by featuring two contrasting rides which coexist in perfect harmony: a classic carousel, and one of the park's newer (if not newest) rides, Adrenalin. The latter is a Street Fighter model from Technical Park, and I'm pretty sure it debuted at Palace Playland in 2007 or 2008, thus making this a pretty recent brochure. Now that I've sufficiently proven that the quality of this park outweighs the quantity of pages in this brochure, perhaps you'll overlook my laziness (which isn't so much laziness as it is craziness). Don't worry, I expect to fully recoup all energy reserves by next week! Aquatica has now really made their new slides for 2010 official, giving the Orlando Sentinel a detailed peak at their plans. We previously discussed what they were up to, but now we have some additional facts. Omaka Rocks will consist of two slides, each of which look to be a Proslide Tantrum model. Each of the courses will feature three mini funnels along the way, and the tubes will be semi-transparent so those on the ground can see the two person rafts as they travel down. The Omaka Rocka is set to debut by March. "Twas a long time ago, longer now than it seems, in a place that perhaps you've seen in your dreams. For the story that you are about to be told, took place in the holiday worlds of old. Now, you've probably wondered where holidays come from. If you haven't, I'd say it's time you begun." 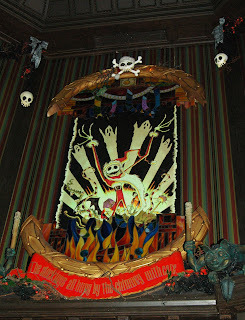 Walt Disney began developing the concept of a haunted mansion nearly 20 years before it was actually constructed. 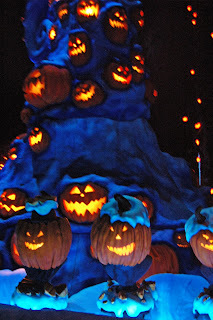 Versions of a haunted house attraction appeared in early concept art during the initial planning of what would become Disneyland. The foundation for the facade of the Plantation style mansion took place in 1962. Finally, after years of planning the New Orleans Square Haunted Mansion opened its doors, on August 9, 1969. 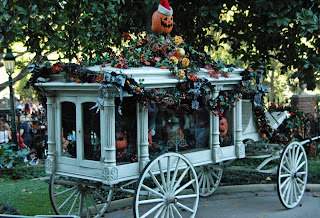 Since 2001 Disneyland's Haunted Mansion has been made over for the holidays. Starting in September and running into January the mansion and grounds under go an ex-scream makeover with characters from Tim Burton's Nightmare Before Christmas joining the 999 ghostly mansion residents. 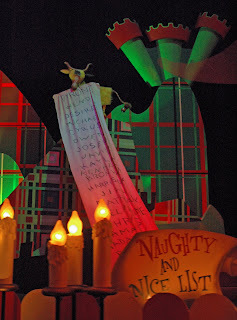 Jack Skellington and some not so scary friends have done some Christmas decorating which will have guests shrieking with delight as they check out Jack's Christmas displays. And sit together, now and forever. For it is plain as anyone can see we're simply meant to be." 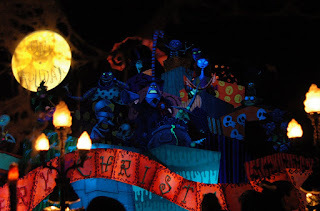 The Haunted Mansion is one our favorites at Disneyland and getting to experience the attraction during the holiday season was something we have wanted to do for quite awhile and we were not disappointed. Jack and friends fit in well with the regular gang. Thanks again to the kind folks at Disneyland resorts and Happy Holidays to all!